Talent swept the floor at the 14th annual Coffee House on March 14. From the 30 performers, more than half were female. The performers were a mix of all ages from middle schoolers to high schoolers from all five schools located at the Sotomayor campus. Throughout the night of the event, students expressed their talent in a variety of ways. Students danced, sang, recited poems, performed stand-up comedy and even played instruments like the guitar, ukulele and piano. Students weren’t the only performers but also some of the staff on campus. A group of freshman from LARS and the School Of History and Dramatic Arts performing a song with their ukuleles accompanied by Robyn Harrison, from the UCLA After School Program. 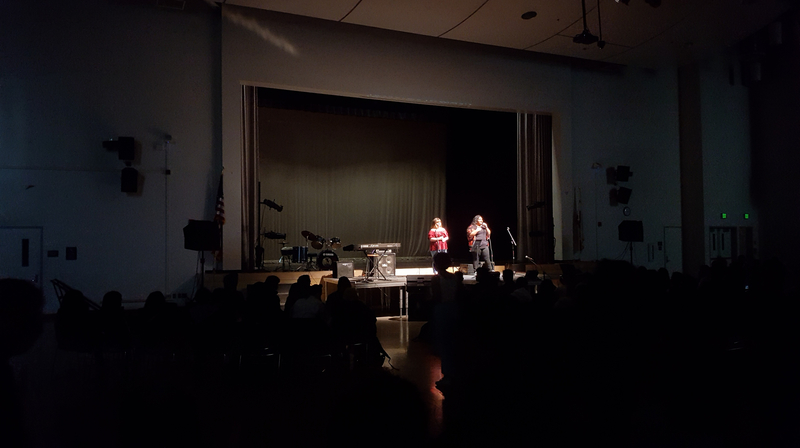 Maya Hernandez, a senior at Los Angeles River School, performed at Coffee House for the first time. “I was definitely nervous, so nervous they had to bring me a stool to sit on because my legs were shaking dramatically” said Hernandez. As a young adult in high school, girls especially, it gets hard for someone to build up the nerve and confidence to go in front of a crowd and make yourself vulnerable to many. For Hernandez, she described her experience up there as scary but exciting. “I have never performed for an audience during my years in highschool. It came as a surprise to people because they have never heard me sing,”said Hernandez. As she was up there she gained the confidence she needed. Maya Hernandez with SODHA Theatre teacher David Levine just before performing. This year’s Coffee House brought 30 performers with 20 of those being female. Every year more and more come to show their talent. “I am a feminist, but just like men, women should be able to have equal opportunities and be able to perform and be supported” said Hernandez. We hope to see more performers next academic year at Coffee House.